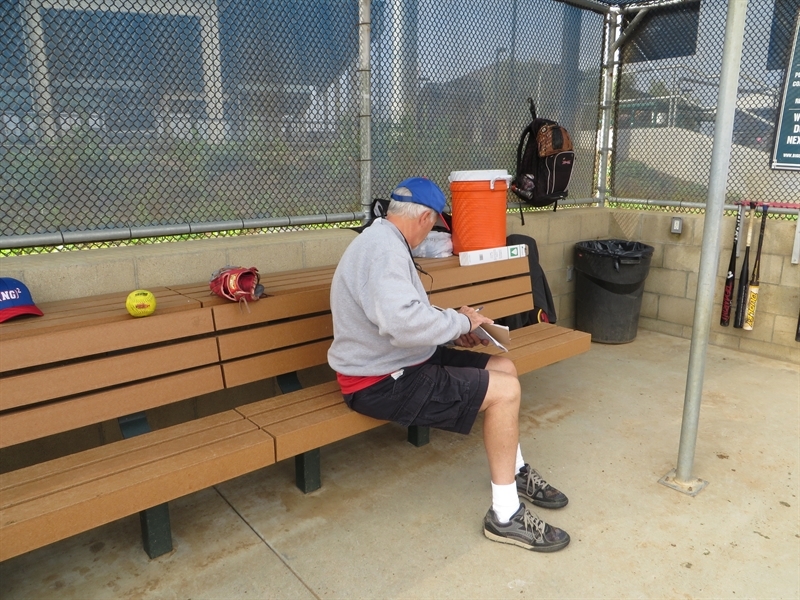 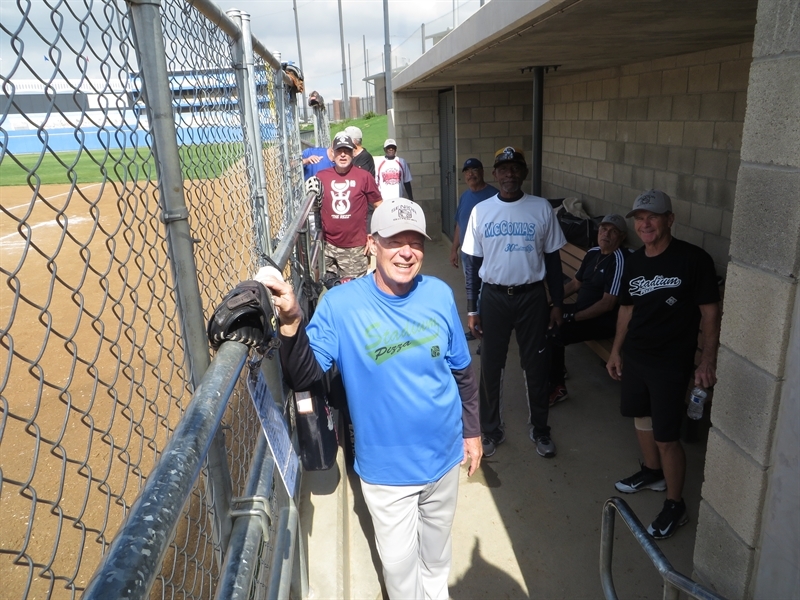 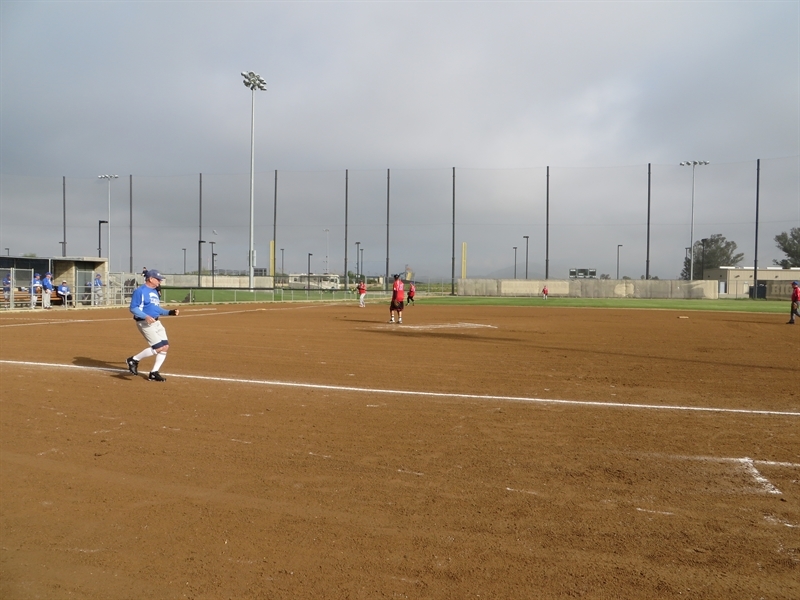 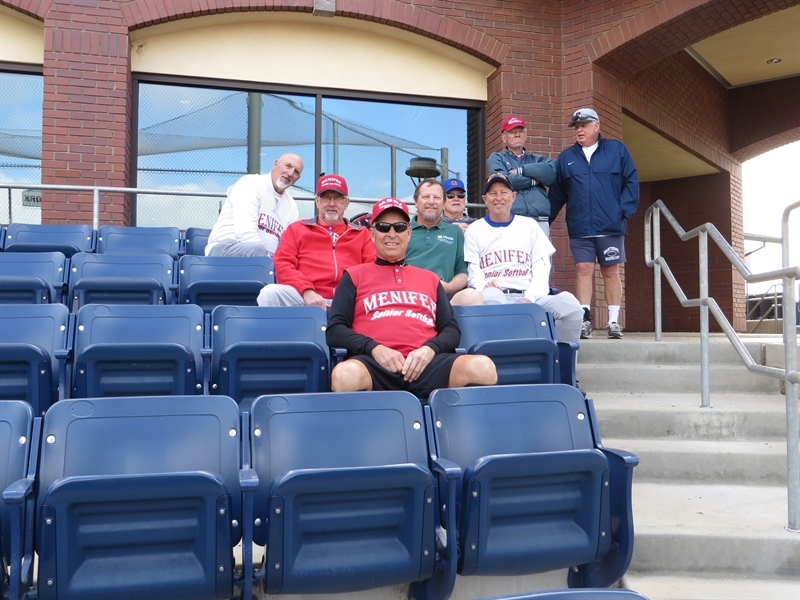 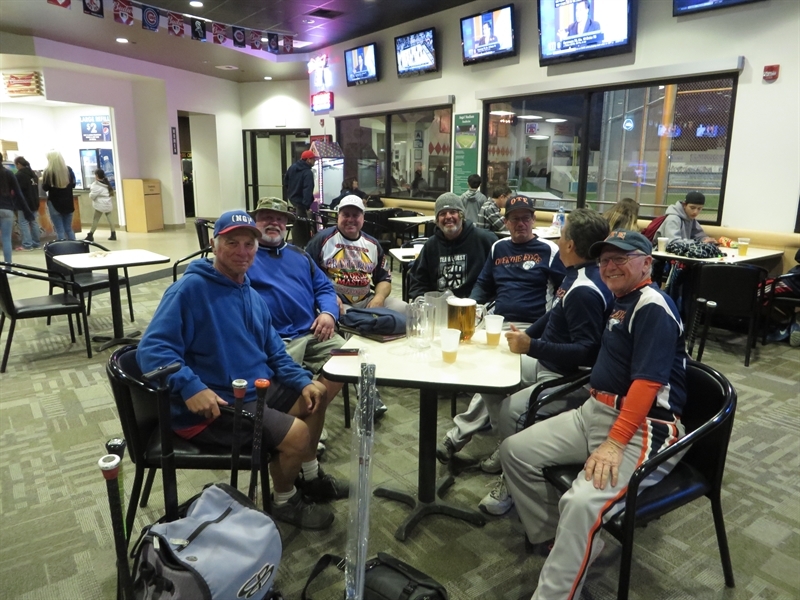 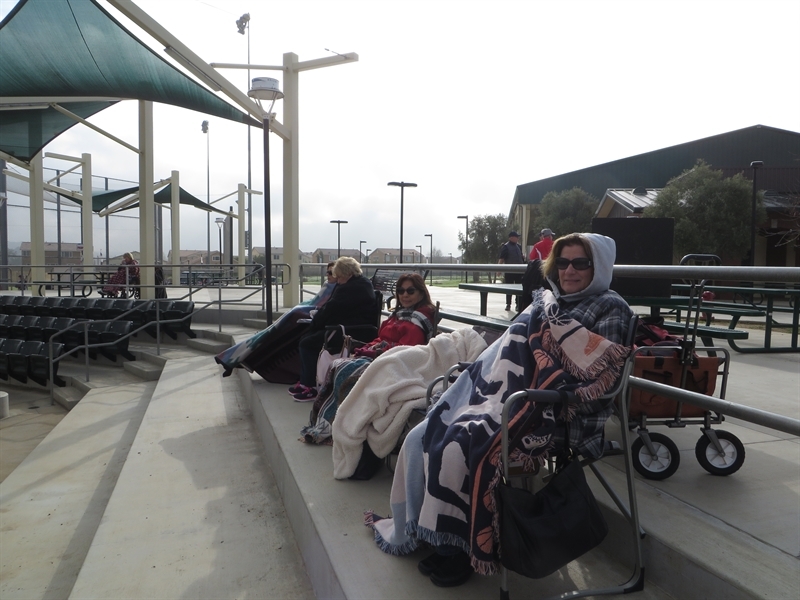 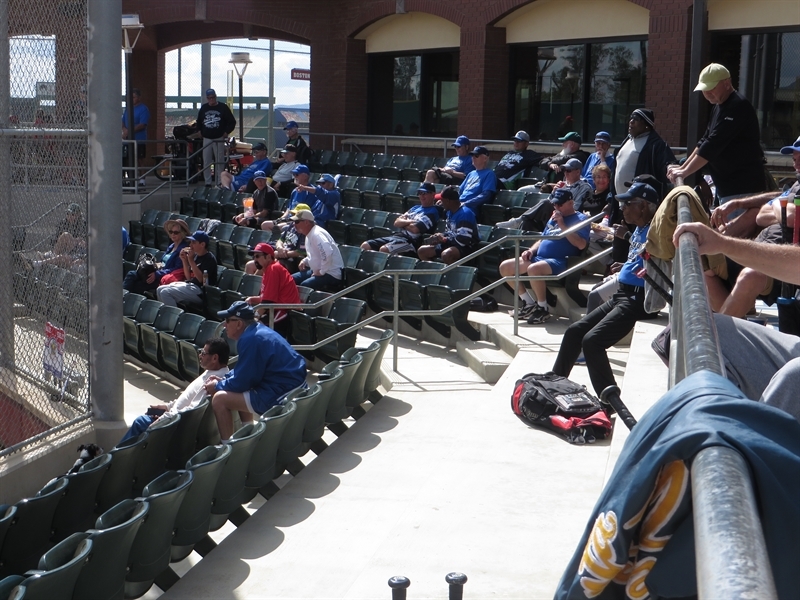 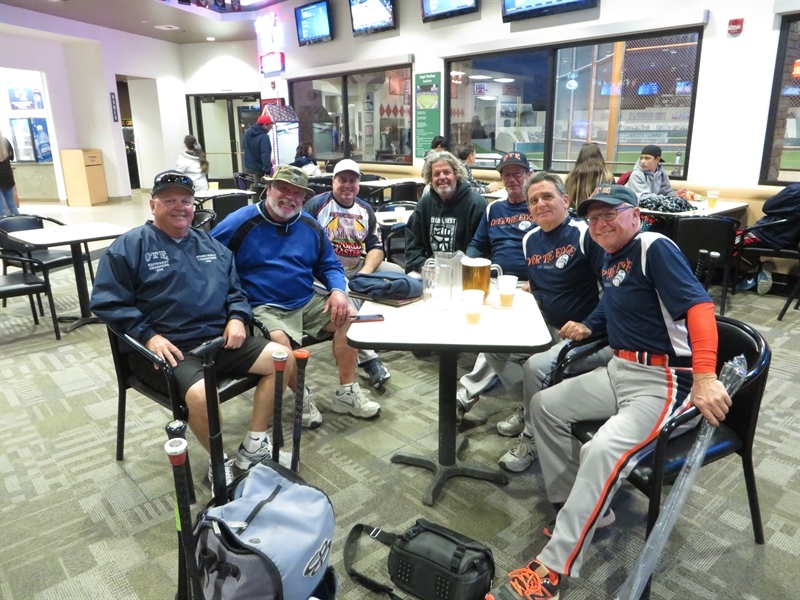 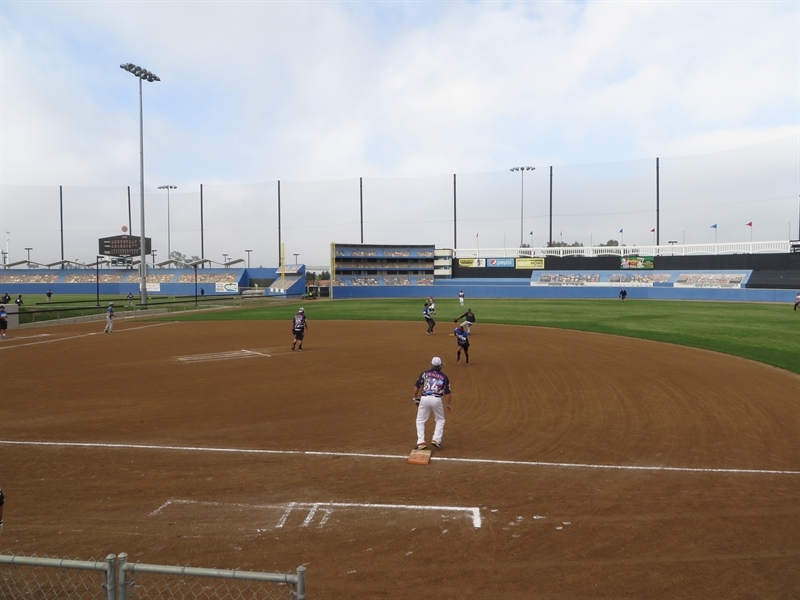 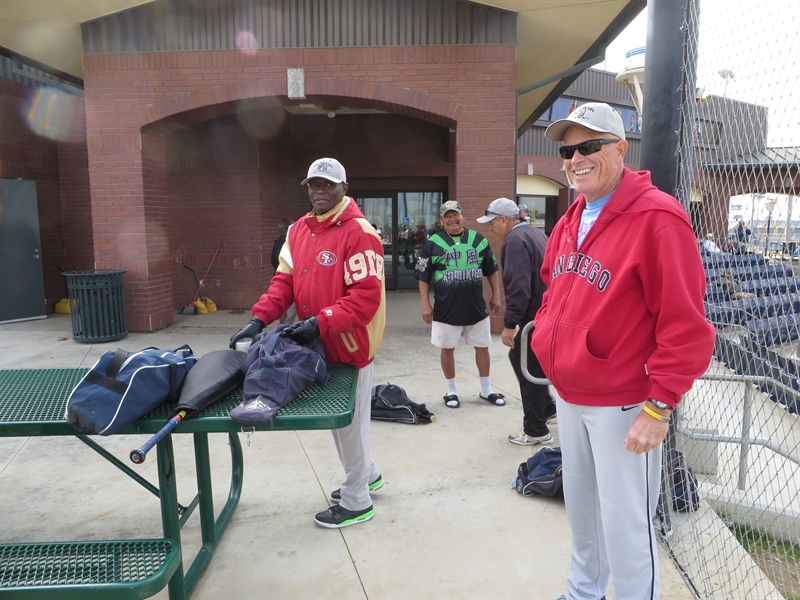 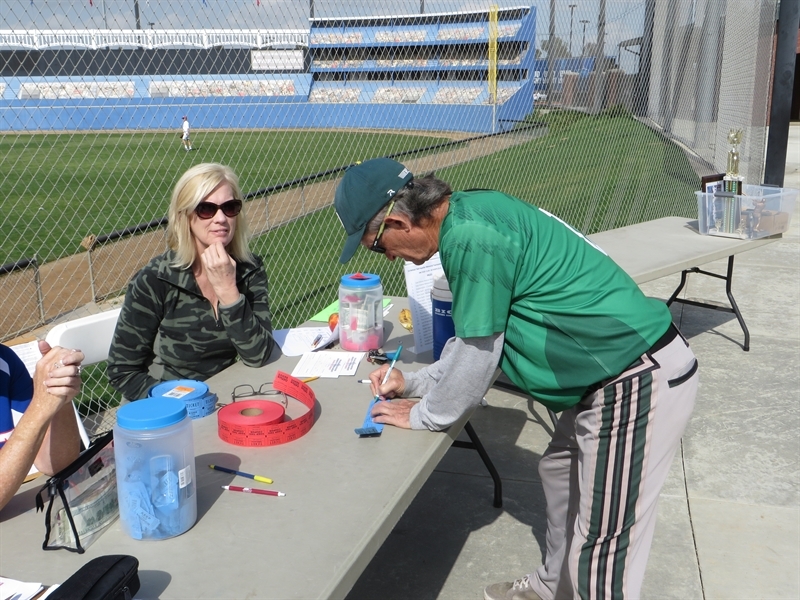 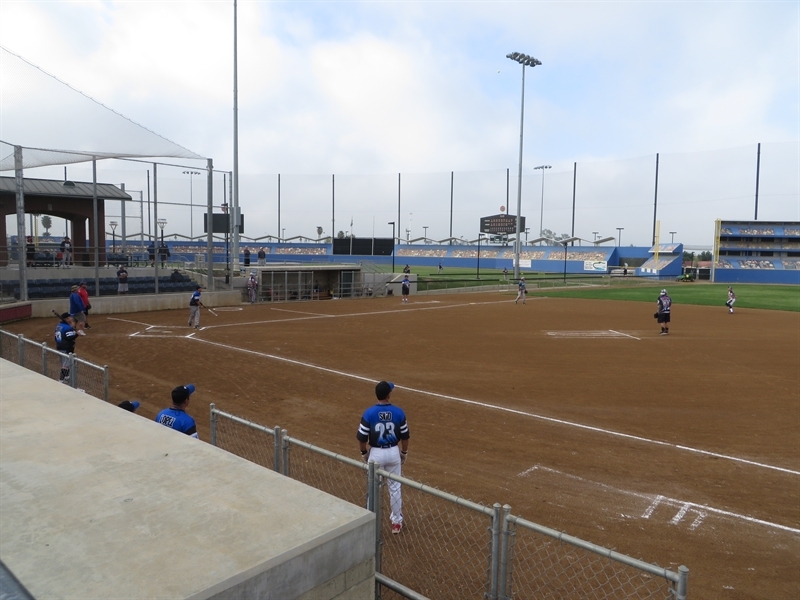 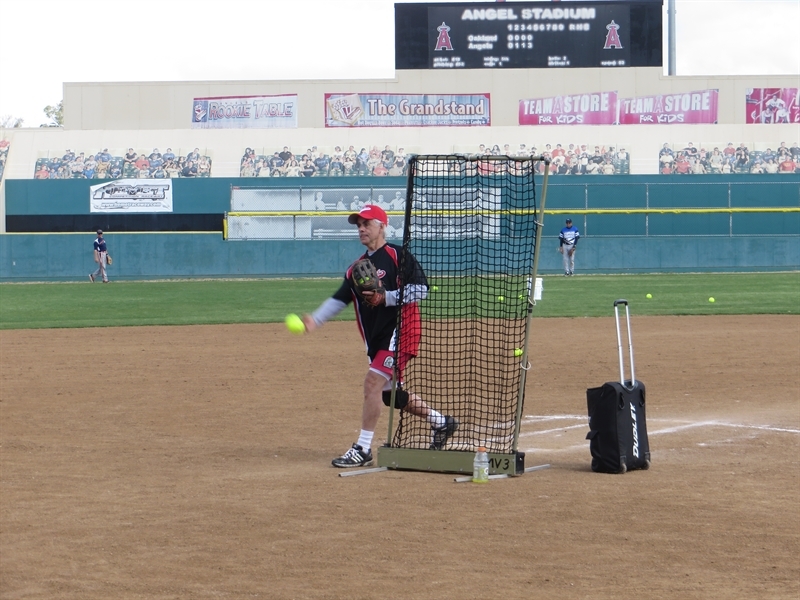 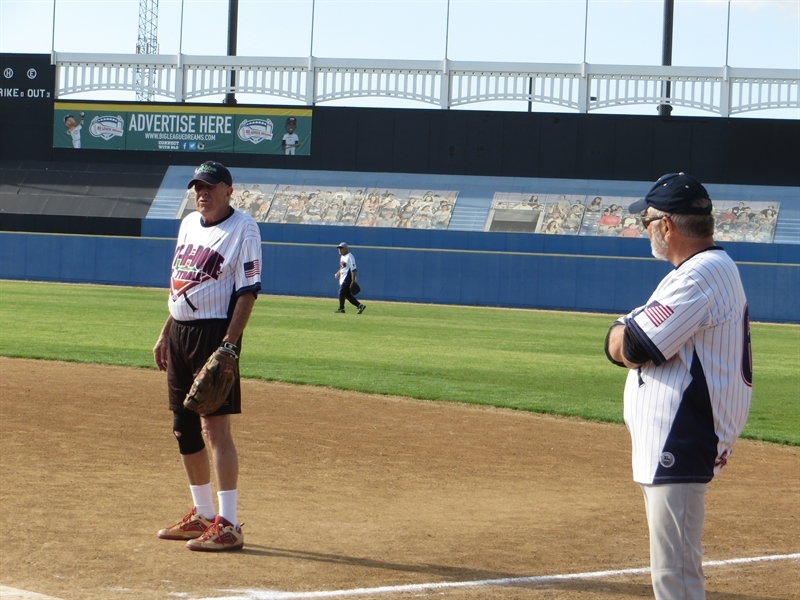 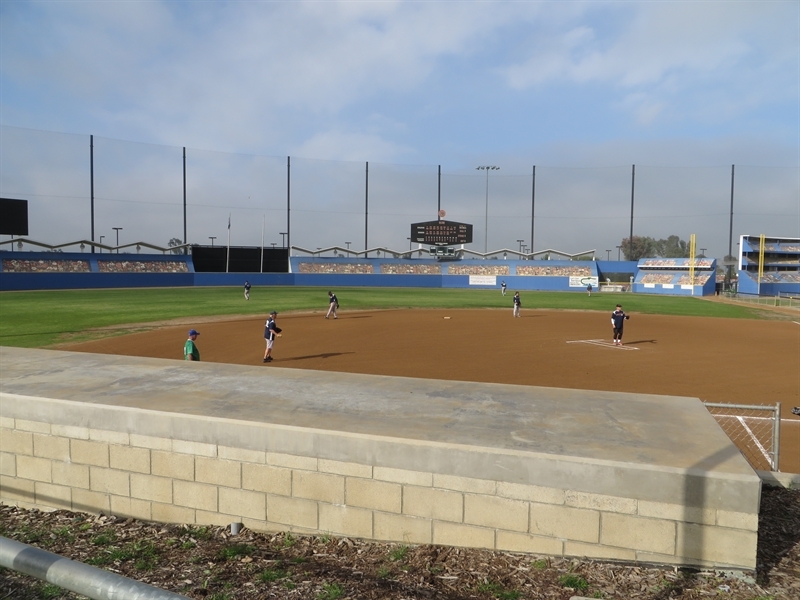 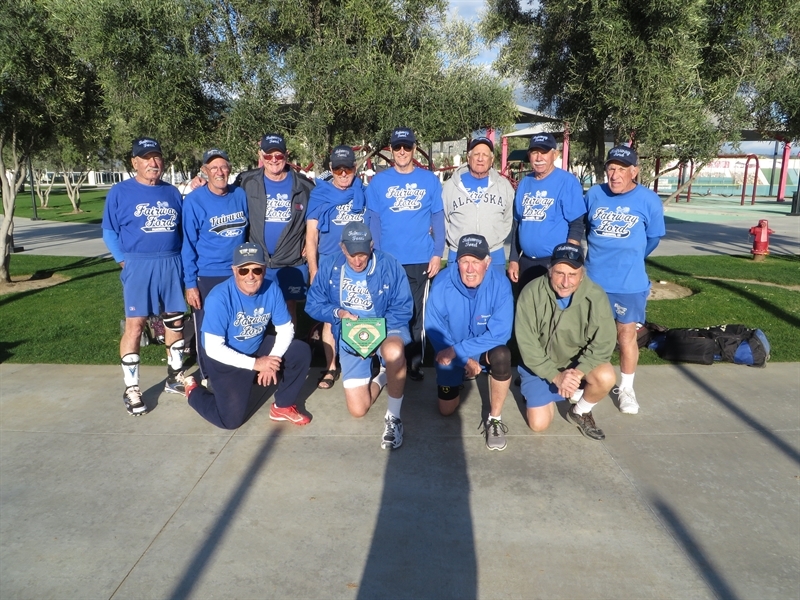 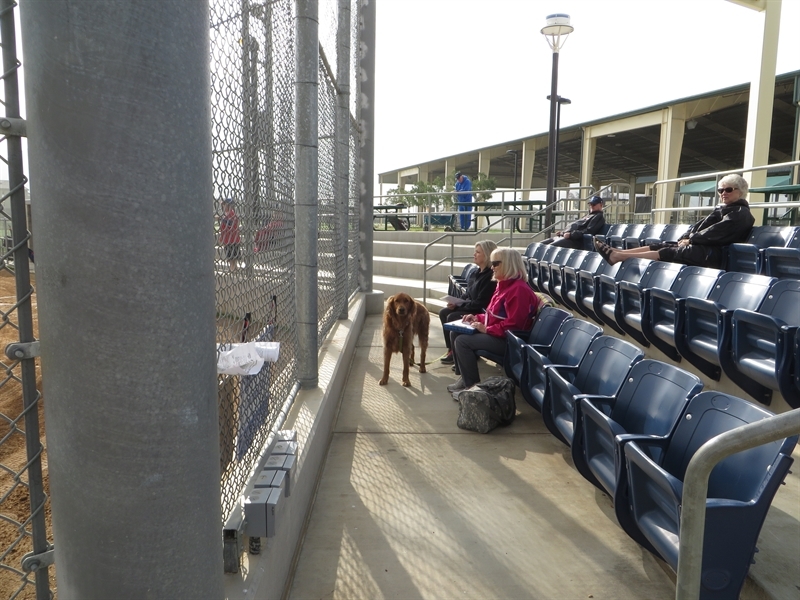 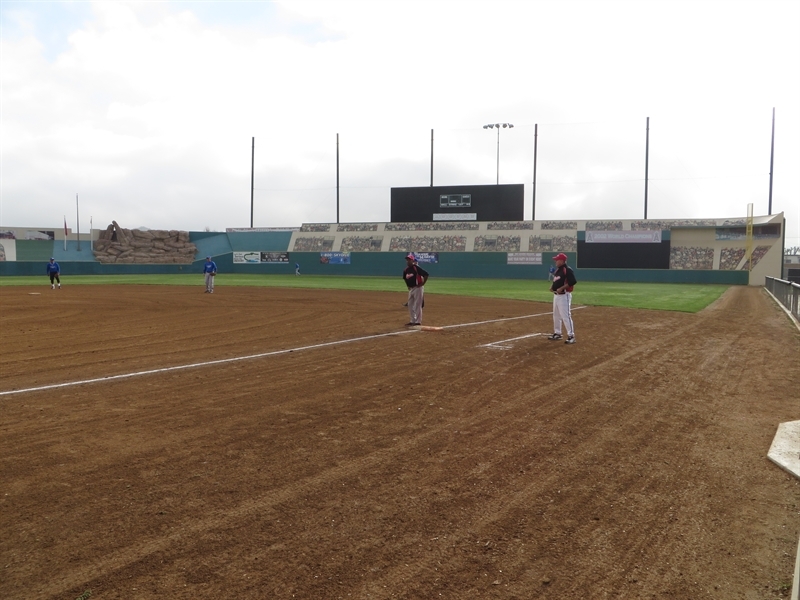 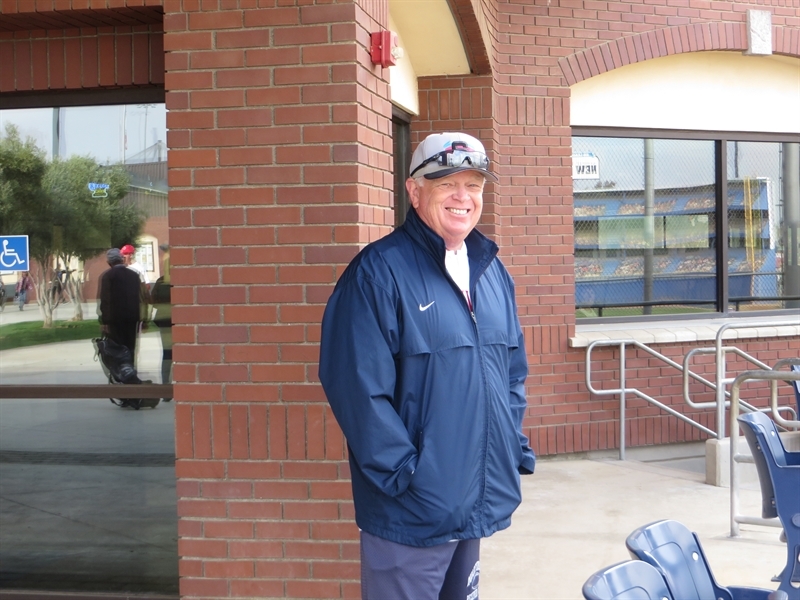 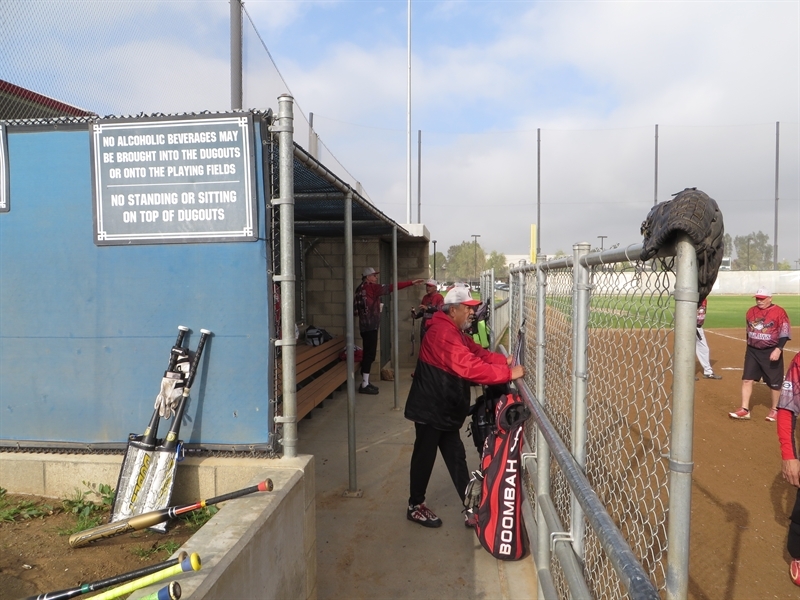 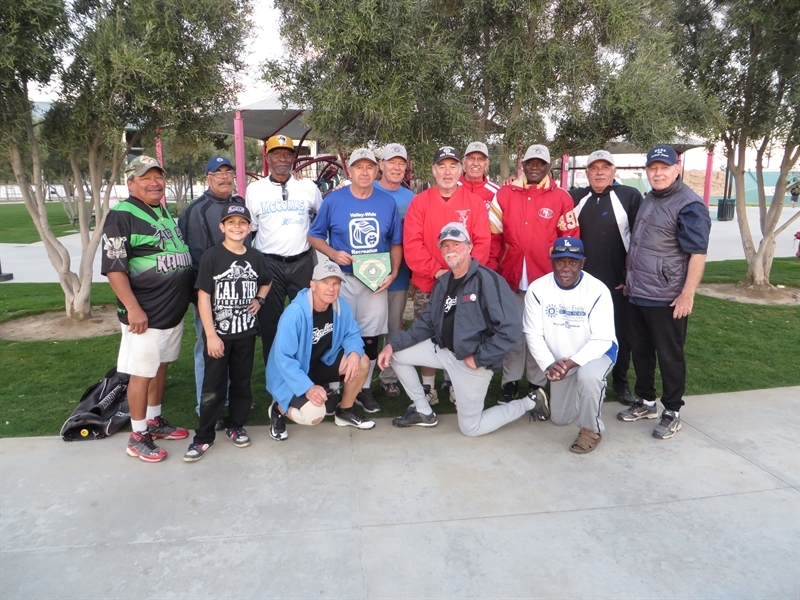 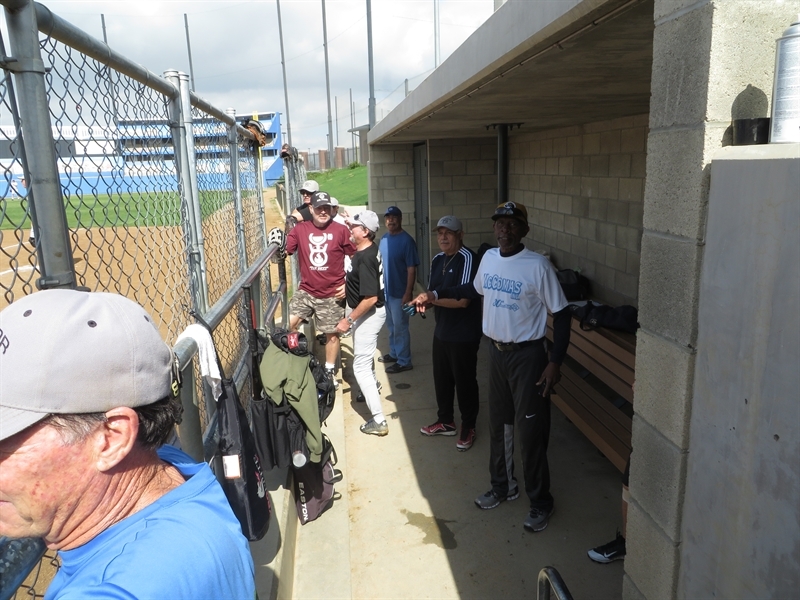 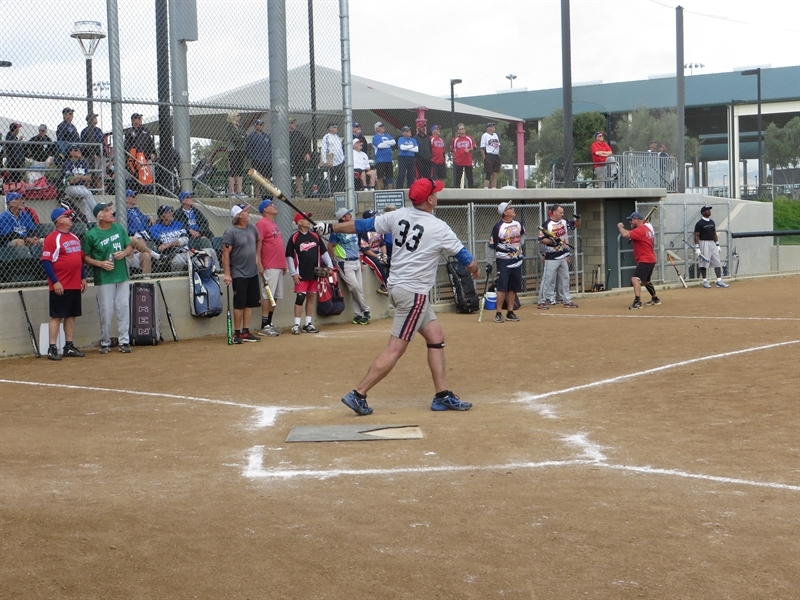 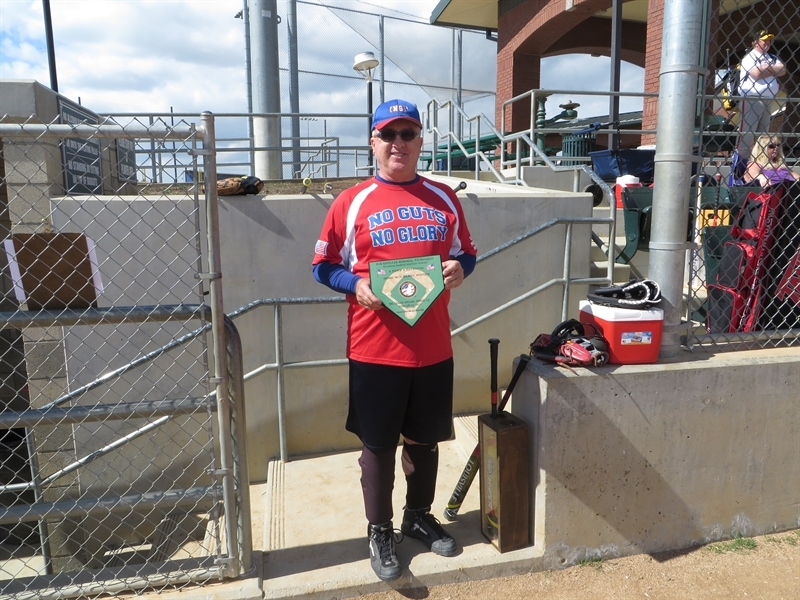 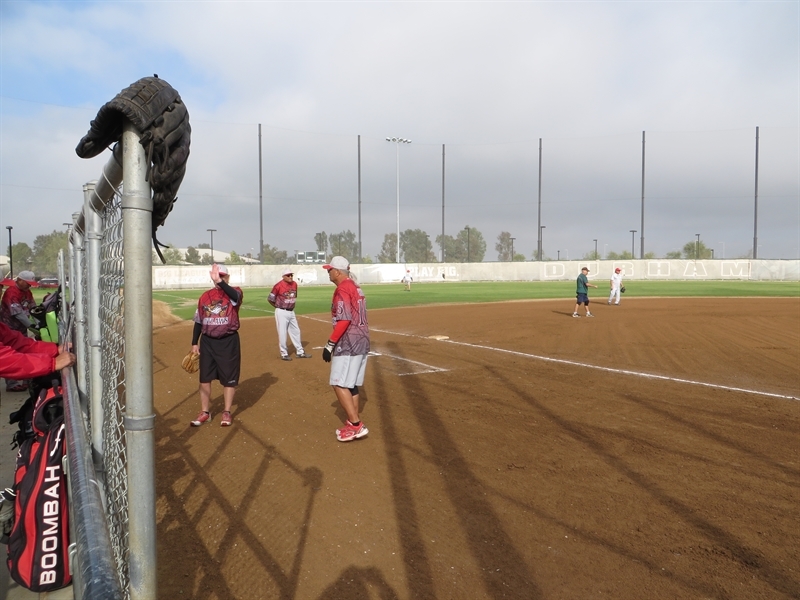 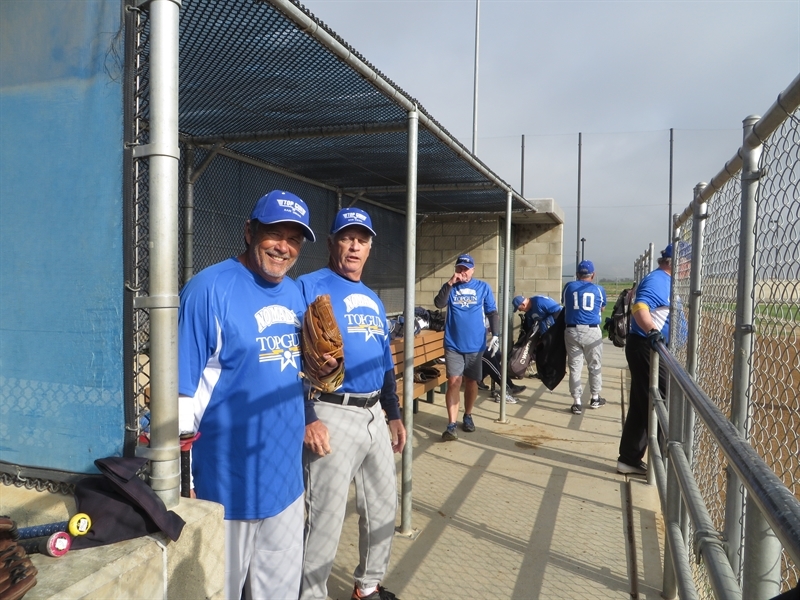 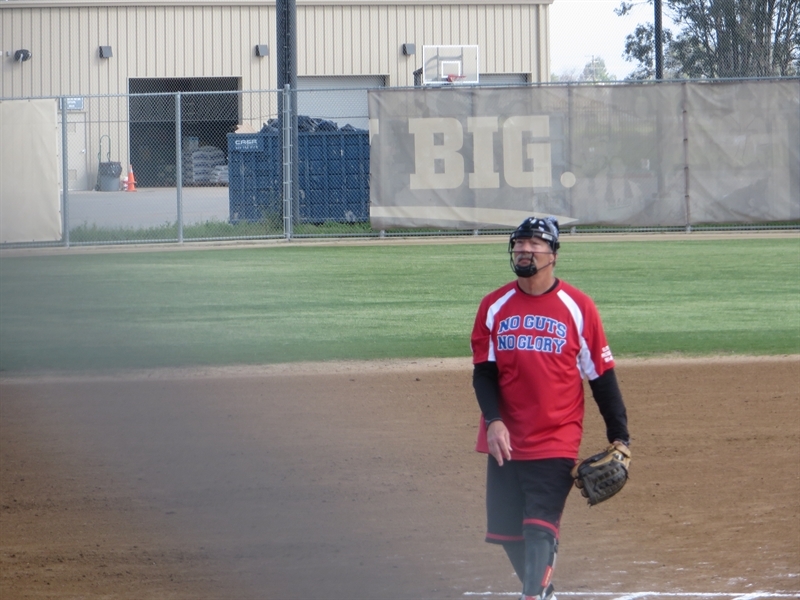 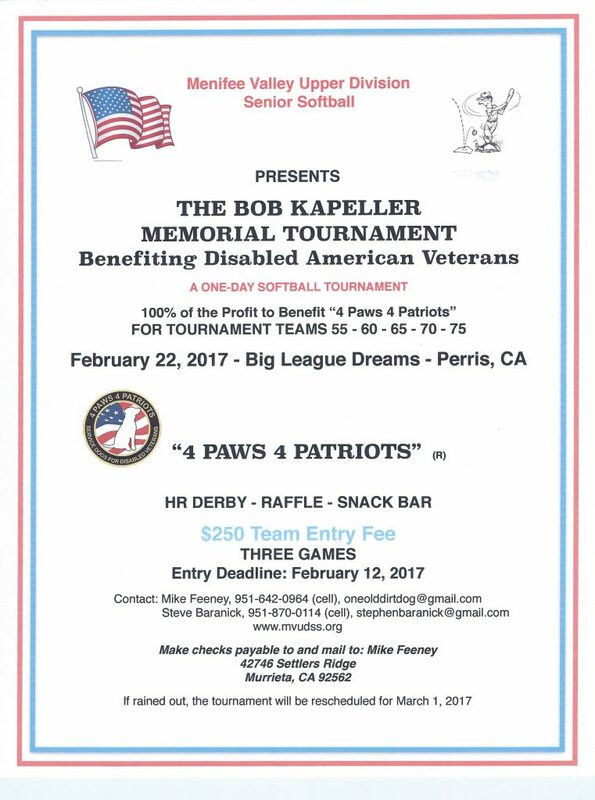 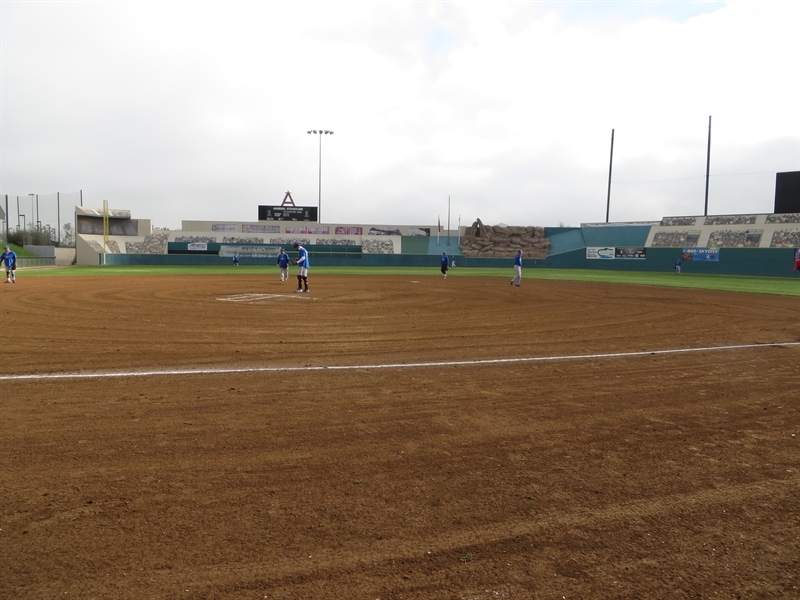 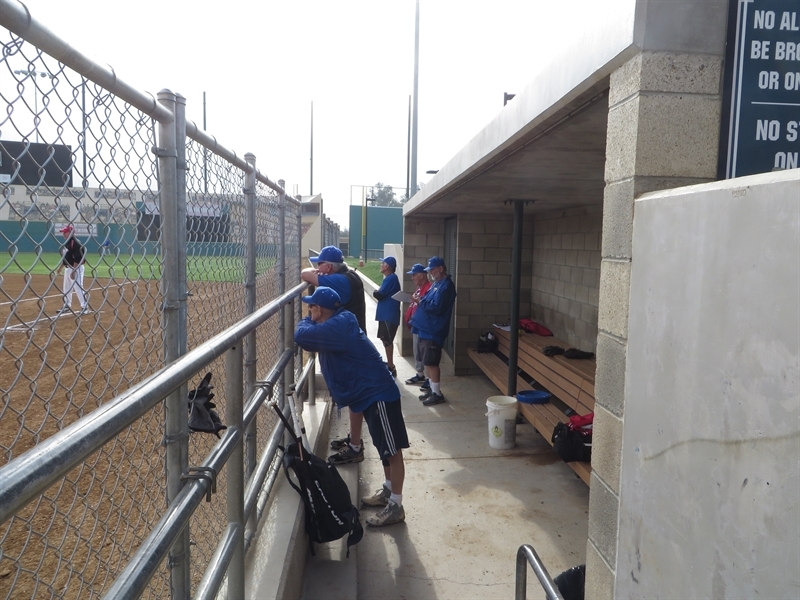 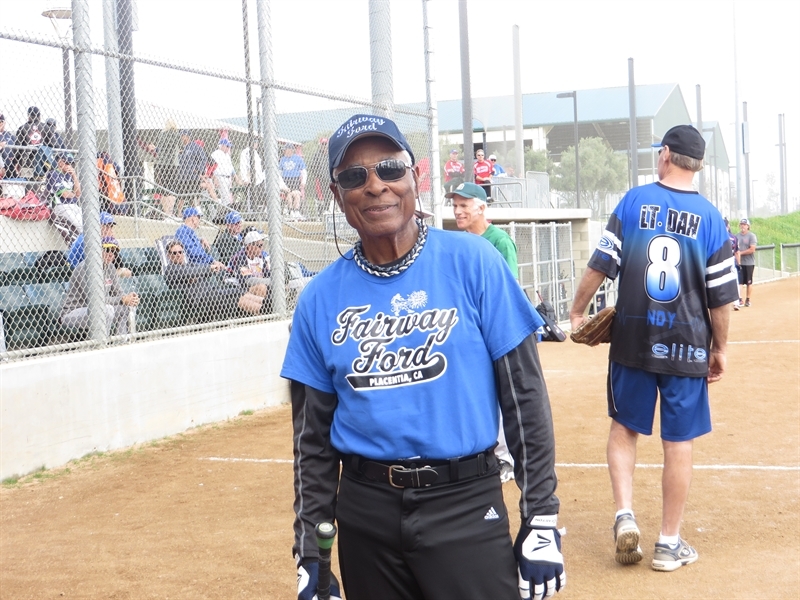 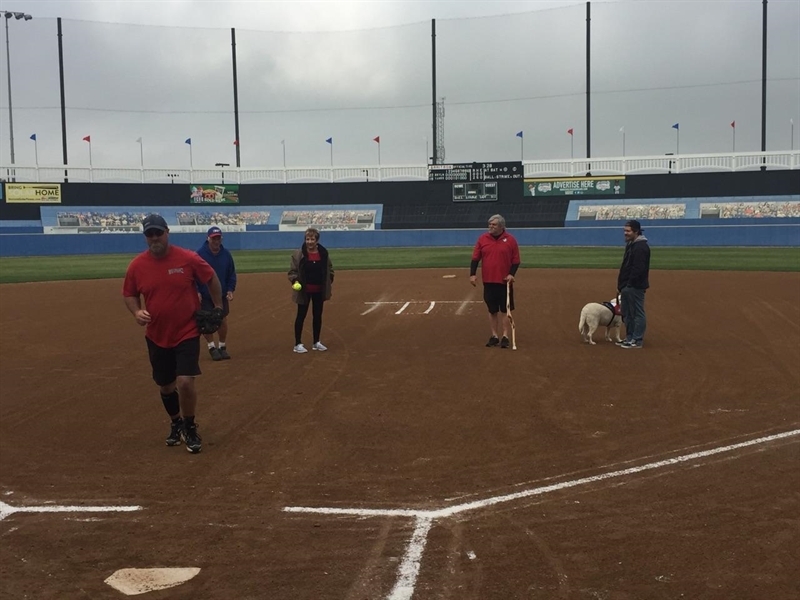 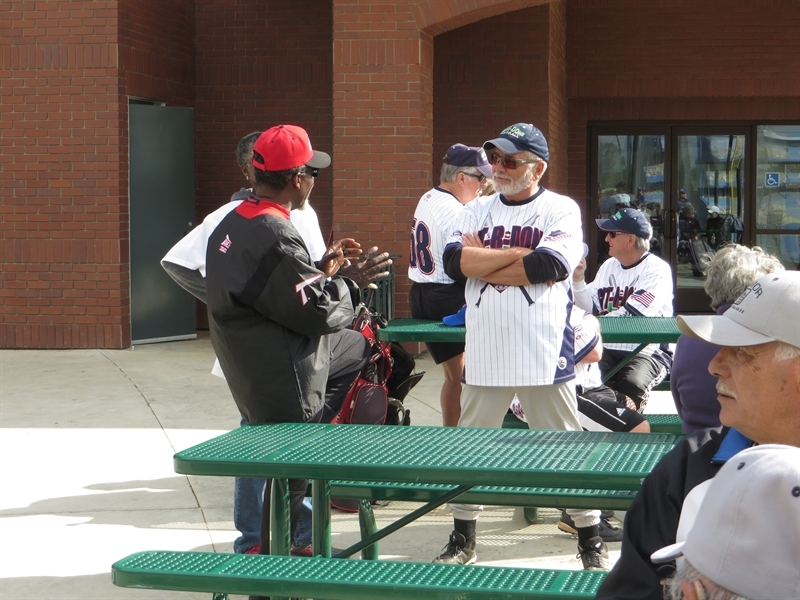 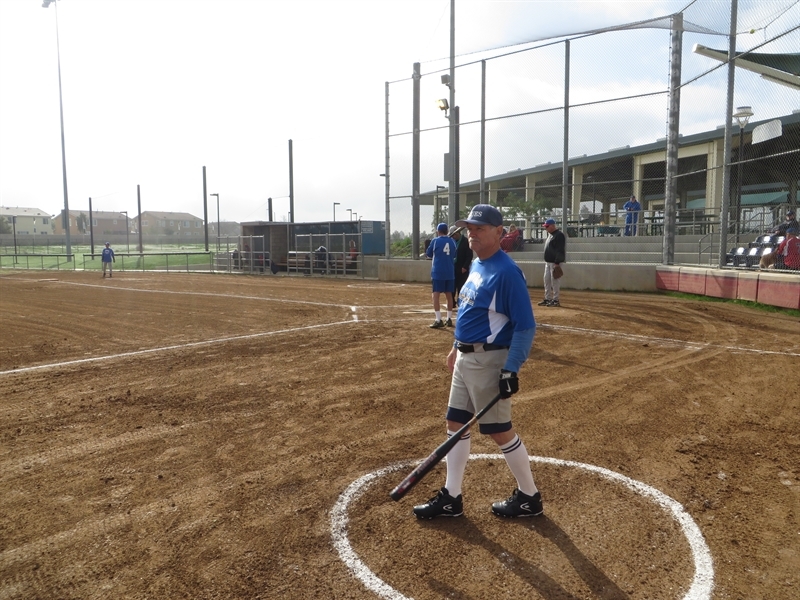 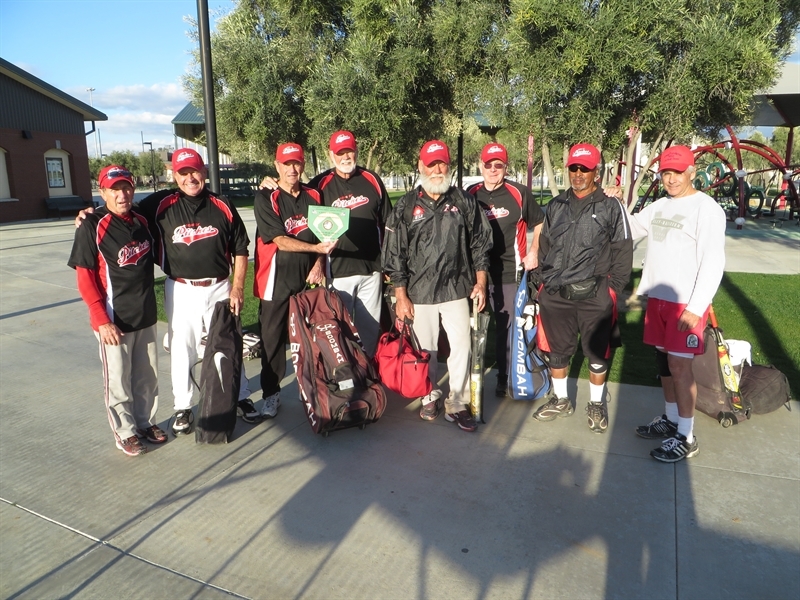 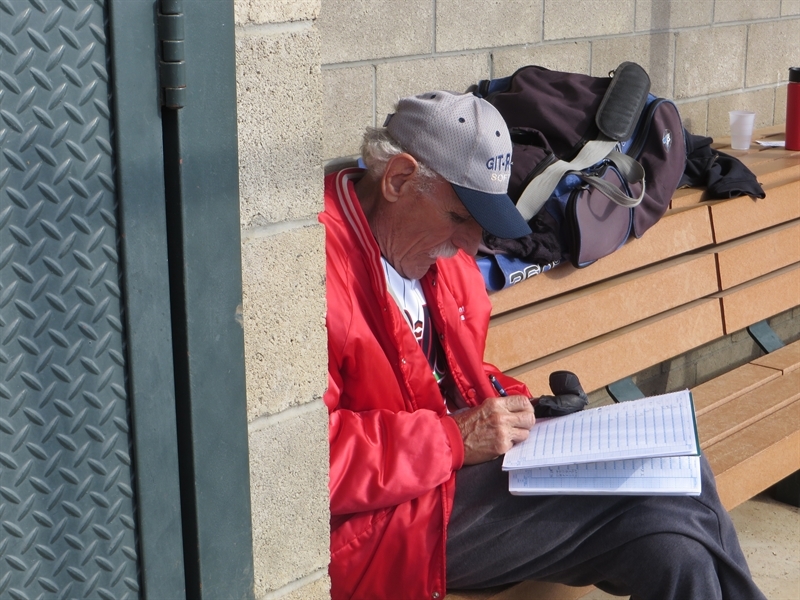 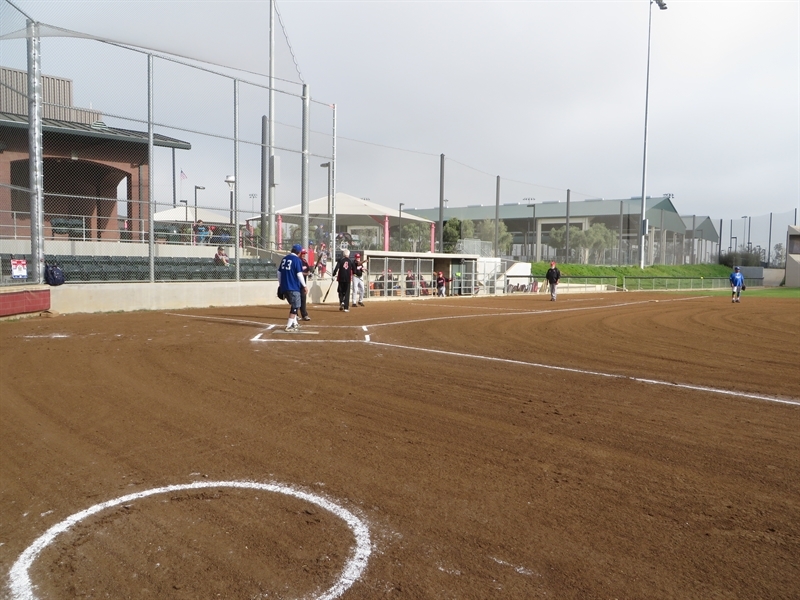 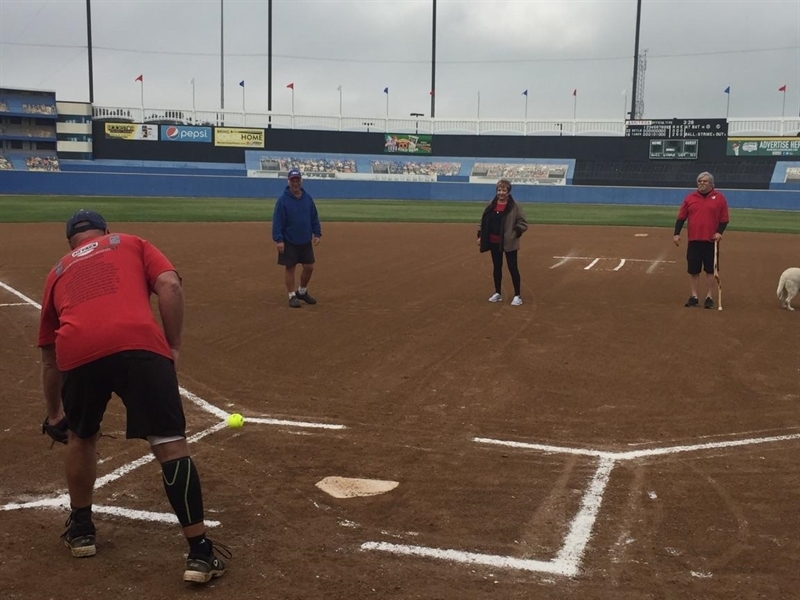 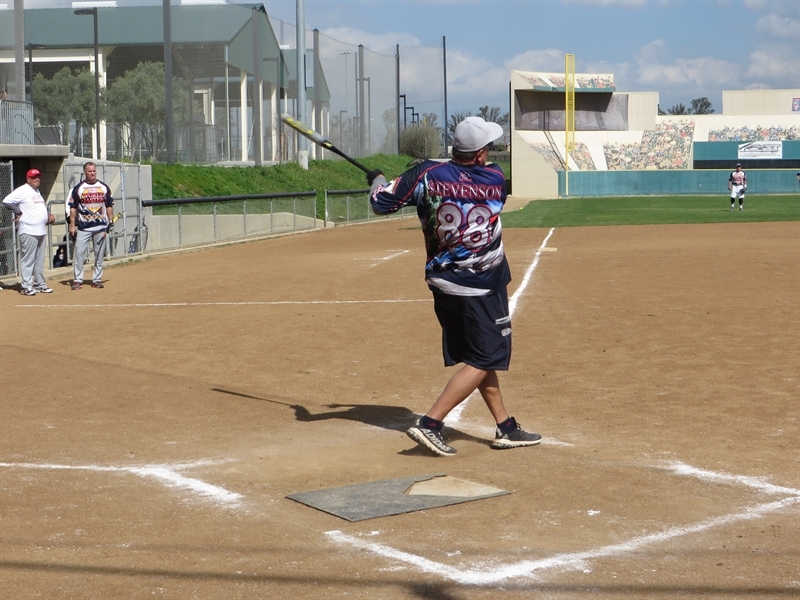 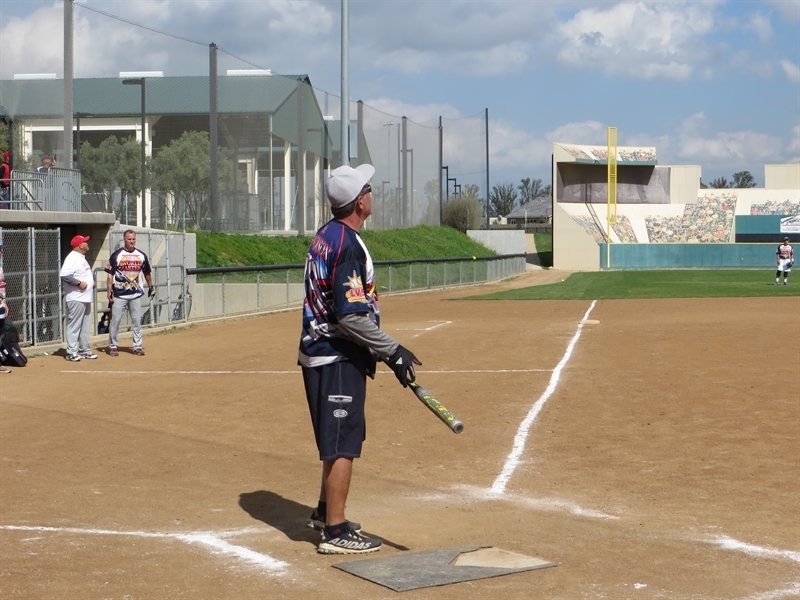 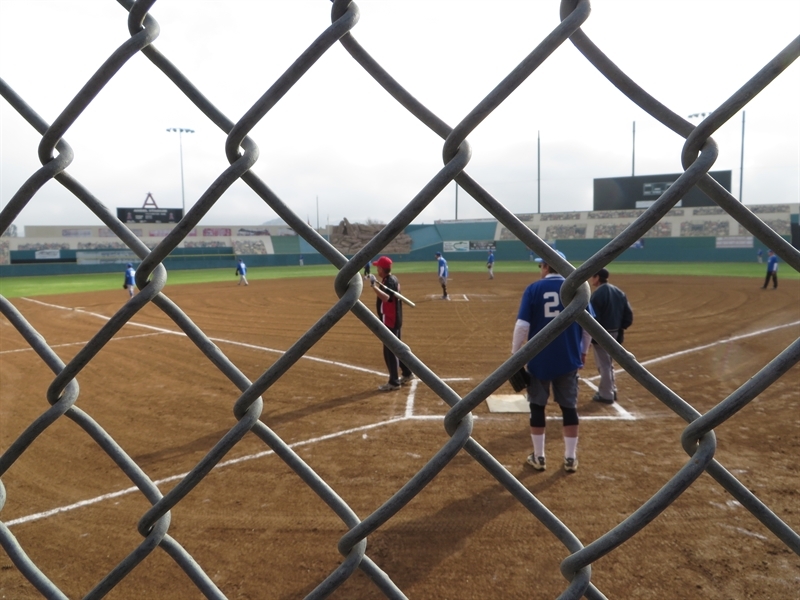 The Bob Kapeller Memorial Tournament was held on Wednesday, February 22, 2017 at the Big League Dreams Sports Park in Perris, CA. 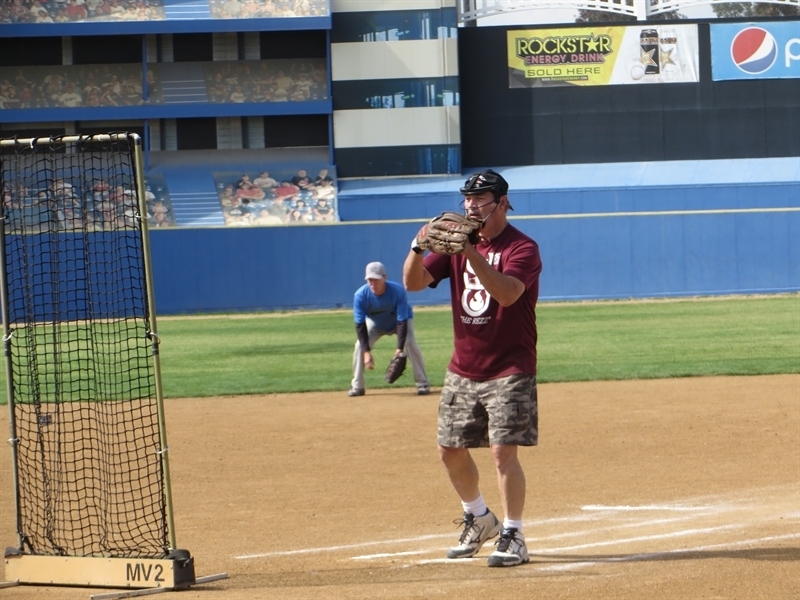 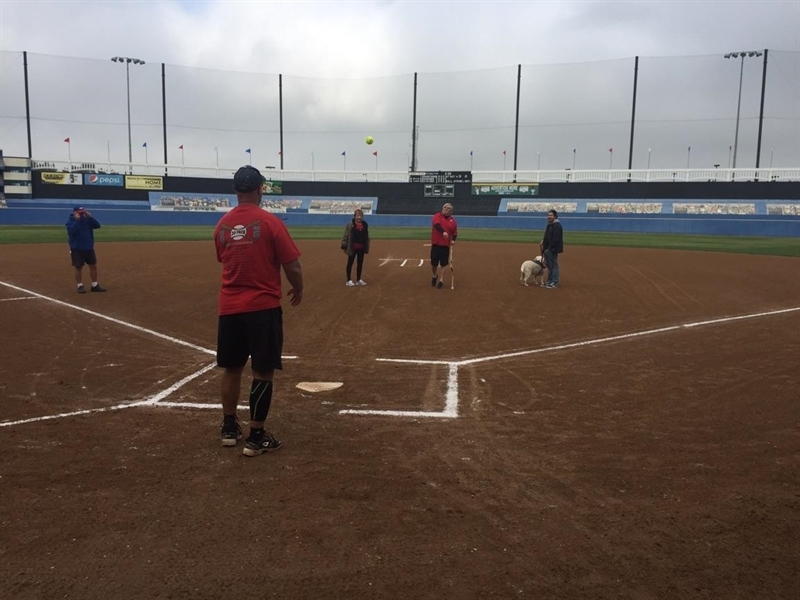 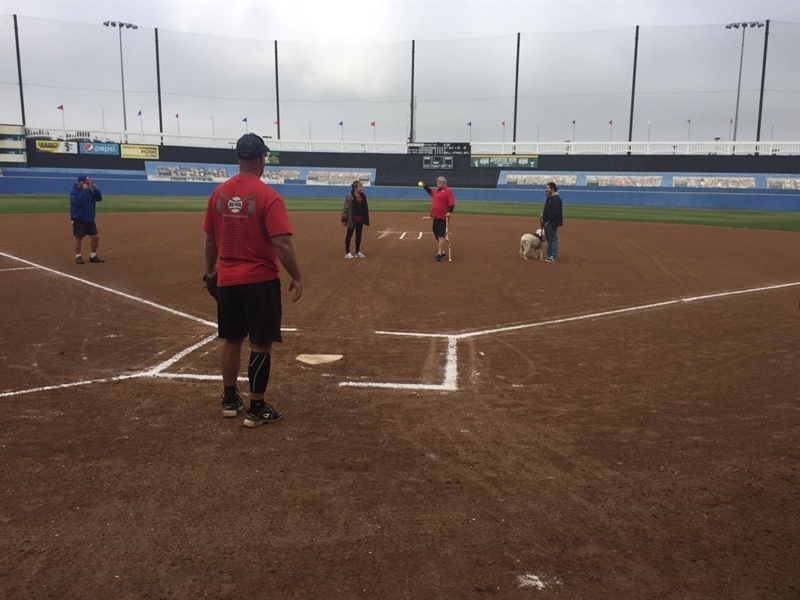 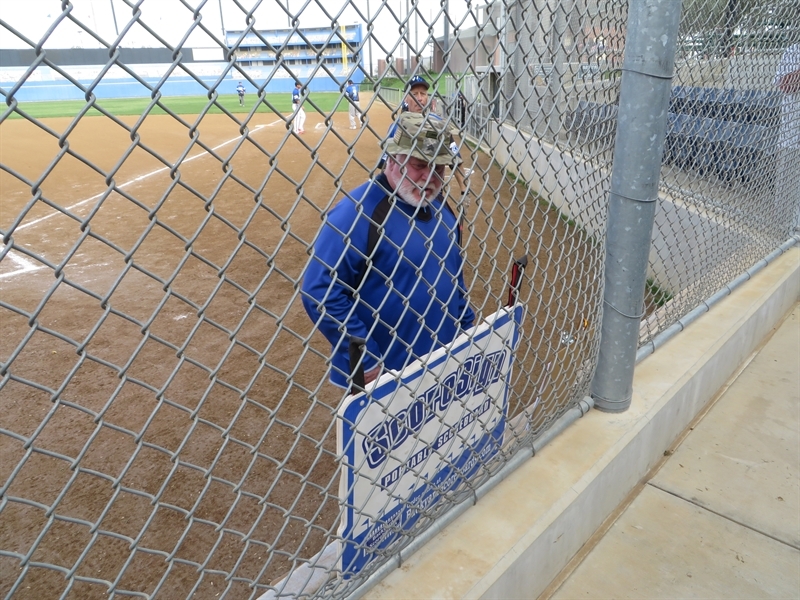 This event, hosted by Menifee Valley Upper Division Senior Softball, honored the disabled veterans and members of our armed forces (both past and present) for their service, dedication, and sacrifices for our country. 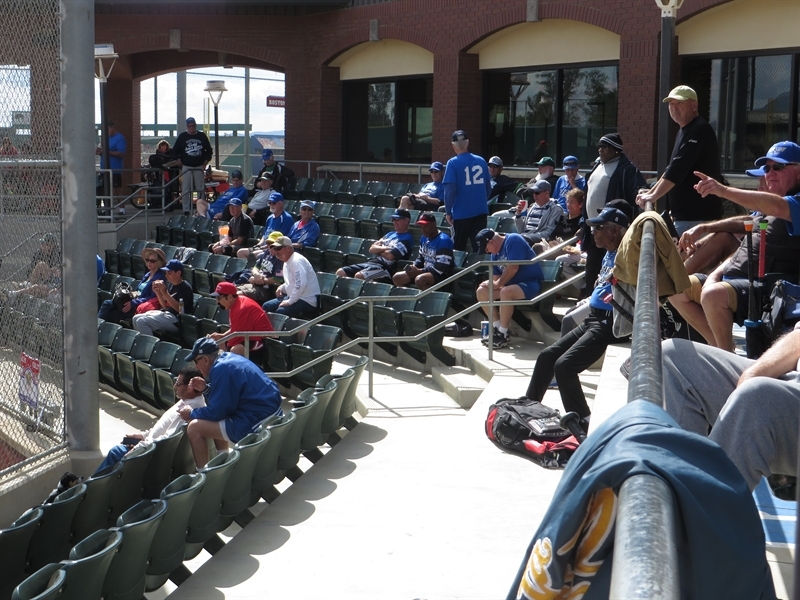 Over 300 players, family, and friends attended this year’s festivities. 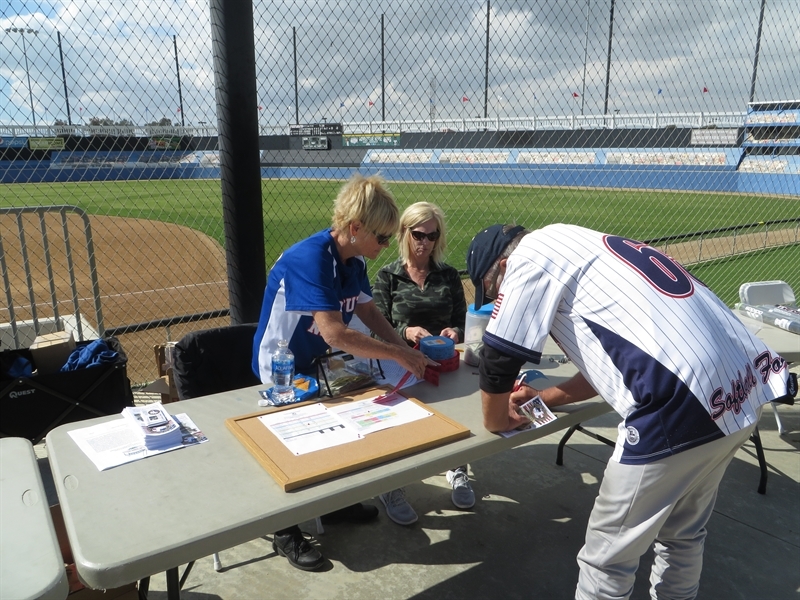 An opening ceremony, 30 softball games, a Home Run Derby, and a raffle were all part of the day’s activities. 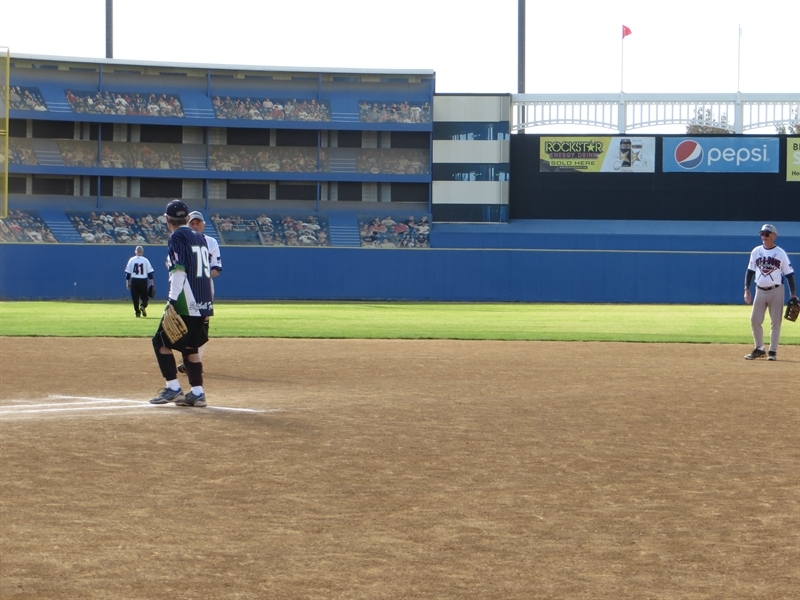 The opening ceremony began at 8:15 am with the presentation of the colors. 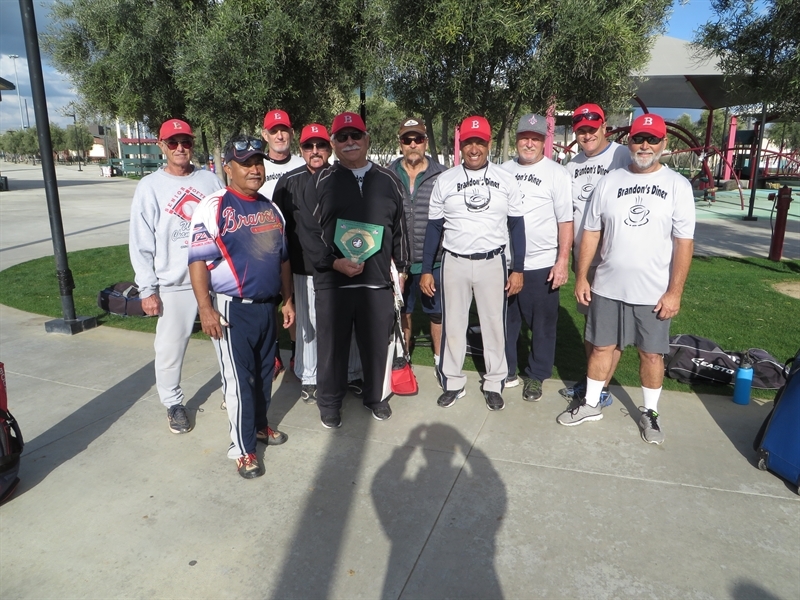 The presentation was led by retired Air Force Technical Sergeant Roy Lantz, a volunteer member of the Riverside National Cemetery Memorial Honor Detail. 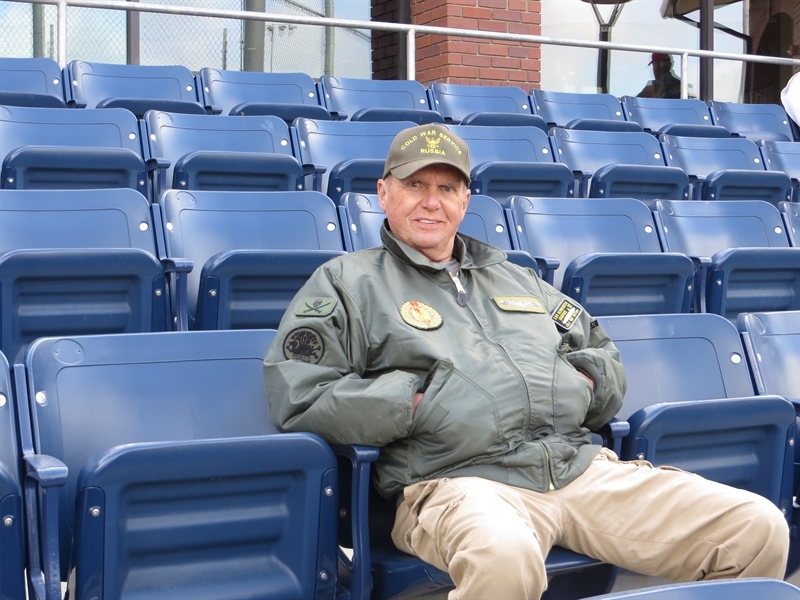 Tim LeBlanc, the CEO of “4 Paws 4 Patriots”, was introduced. 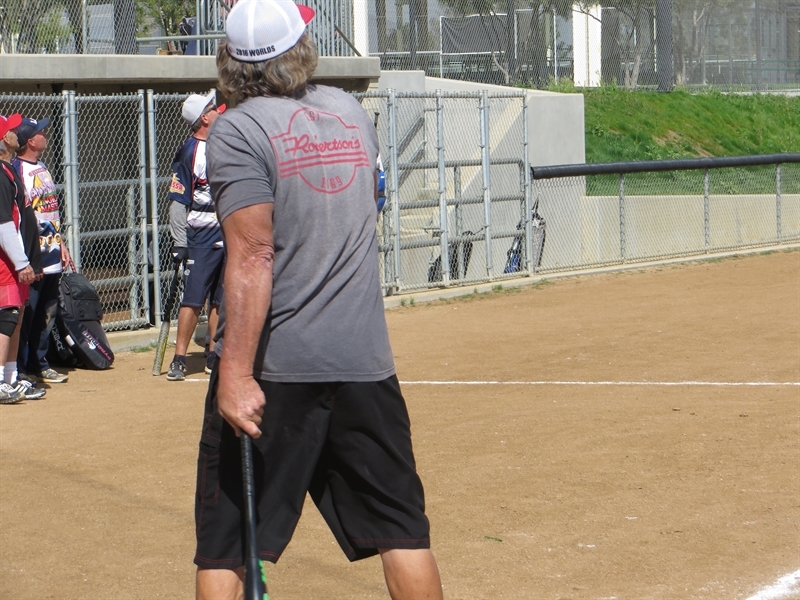 Tim started training dogs as a kid and after many years of refinement and 1000’s of success stores, the system has become one of the most successful training systems ever developed. 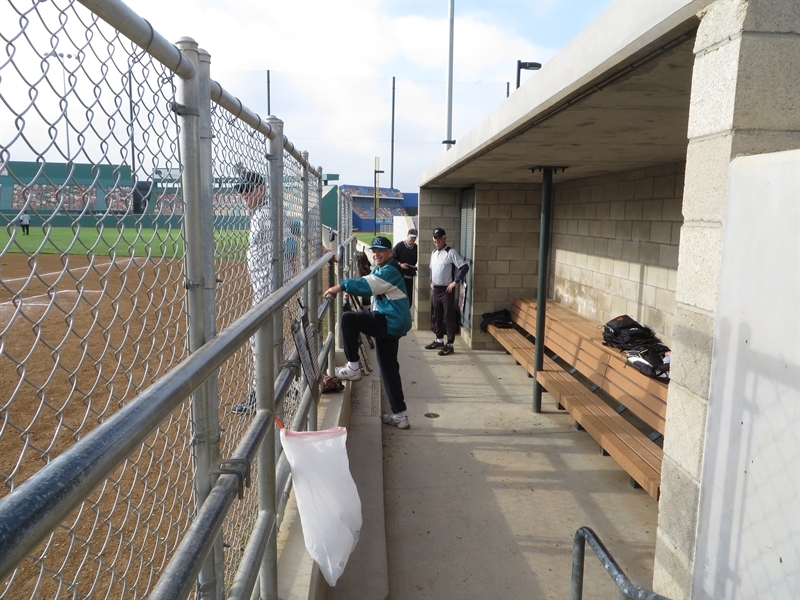 And, they do it all pro bono. 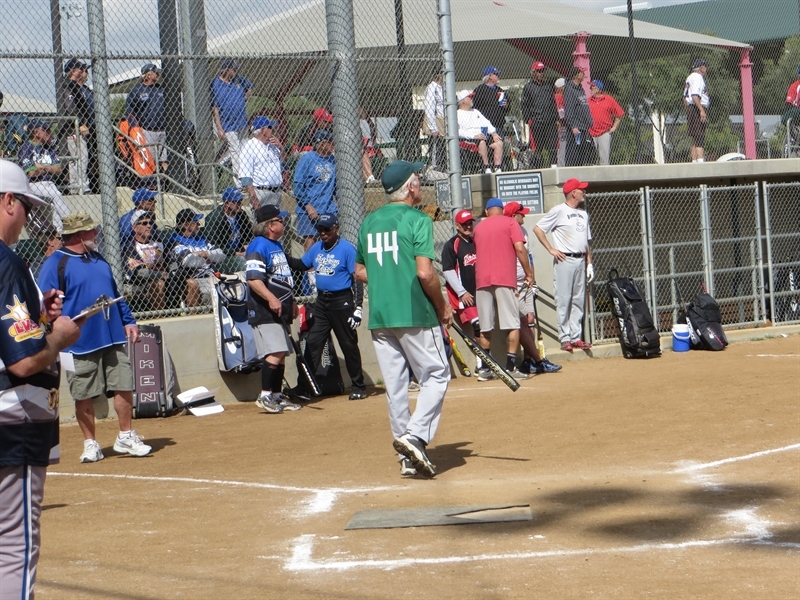 Tim, assisted by his son Justin, and Bob’s wife Kay Kapeller threw out the first ball. 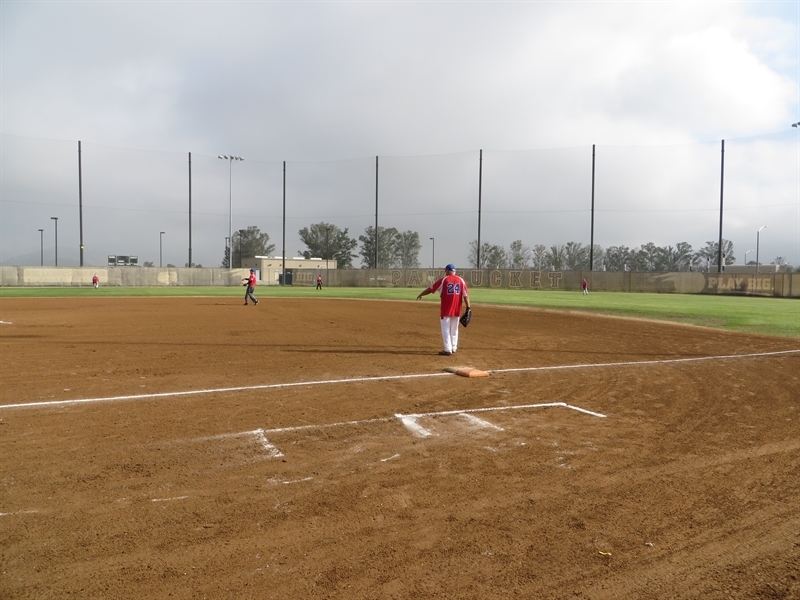 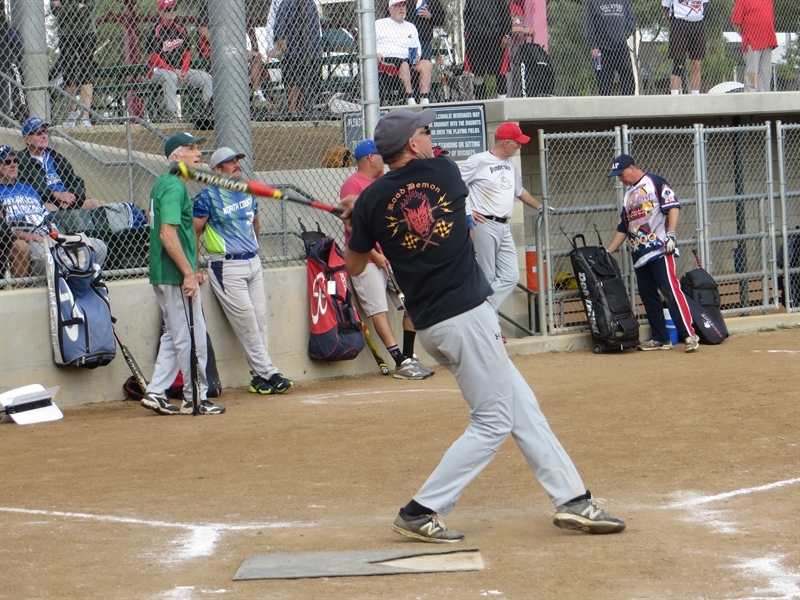 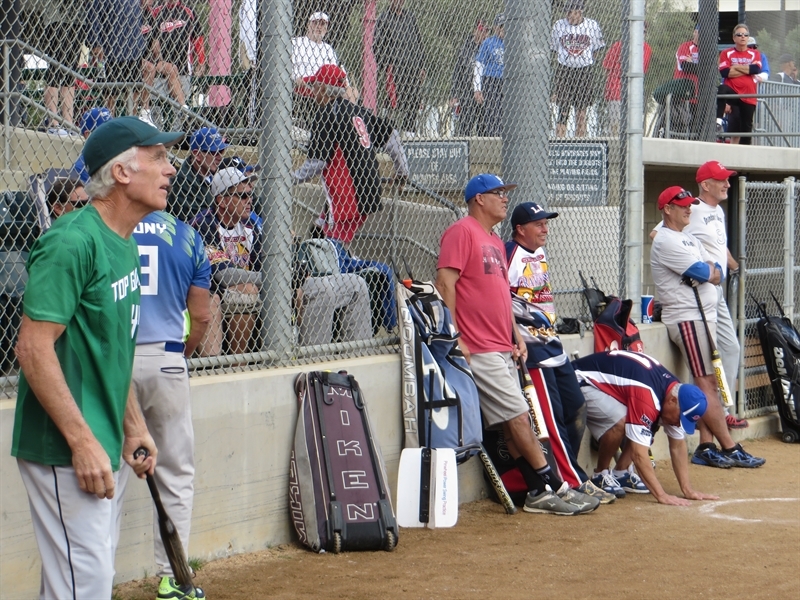 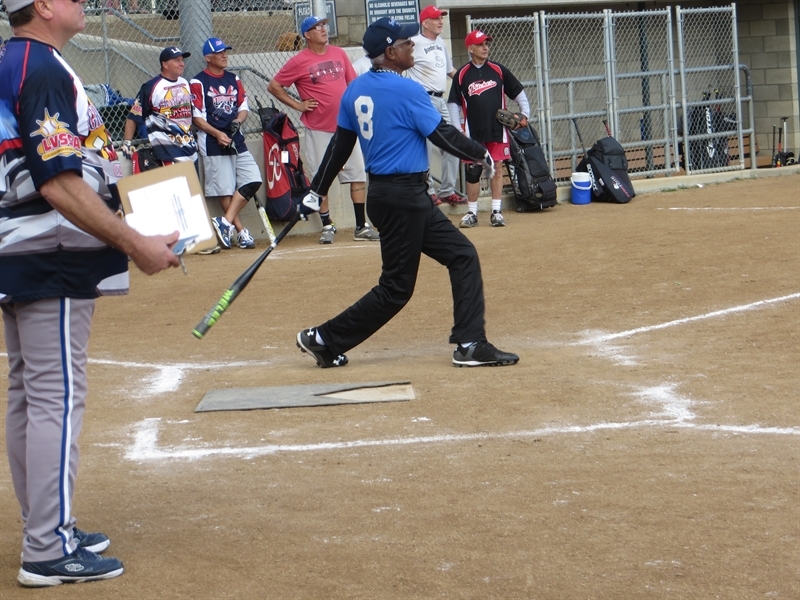 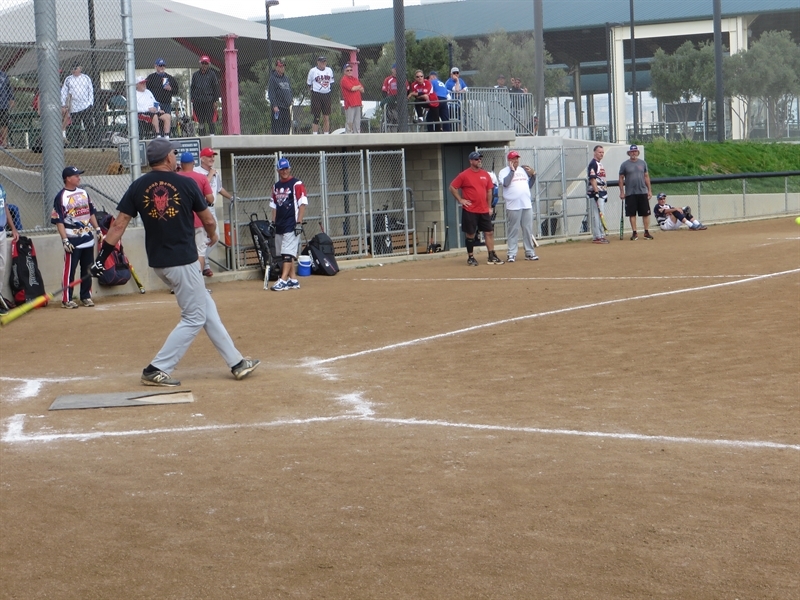 Twenty-one teams competed in the five-division tournament format with 5 games played on each of the 6 fields. 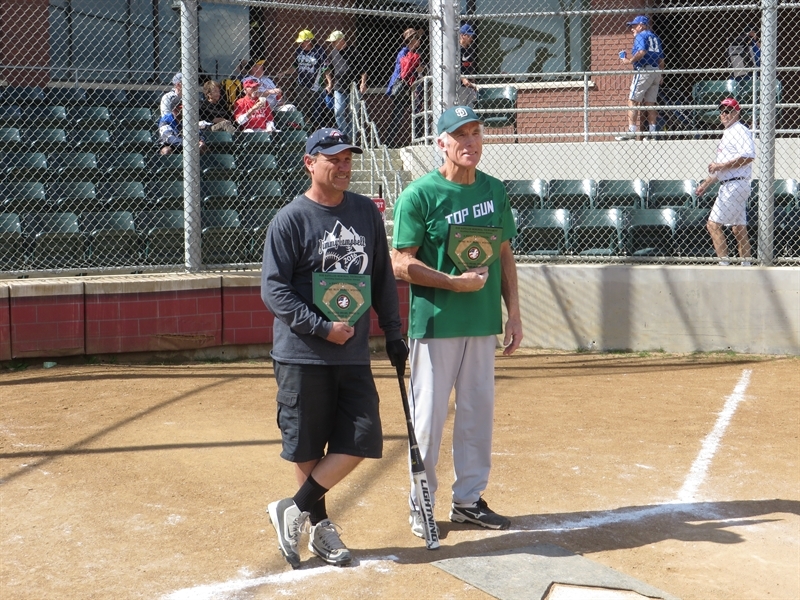 Jason Medeiros won the Home Run Derby in the 55-59 division; John Woolsey in the 60-64 division; and Jack Brunschmid in the 65+ division. 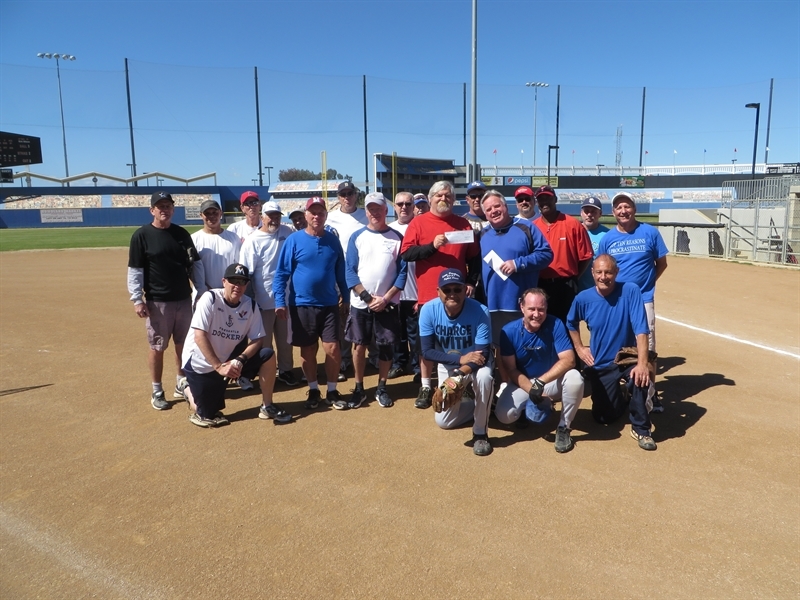 20 players participated in this event. 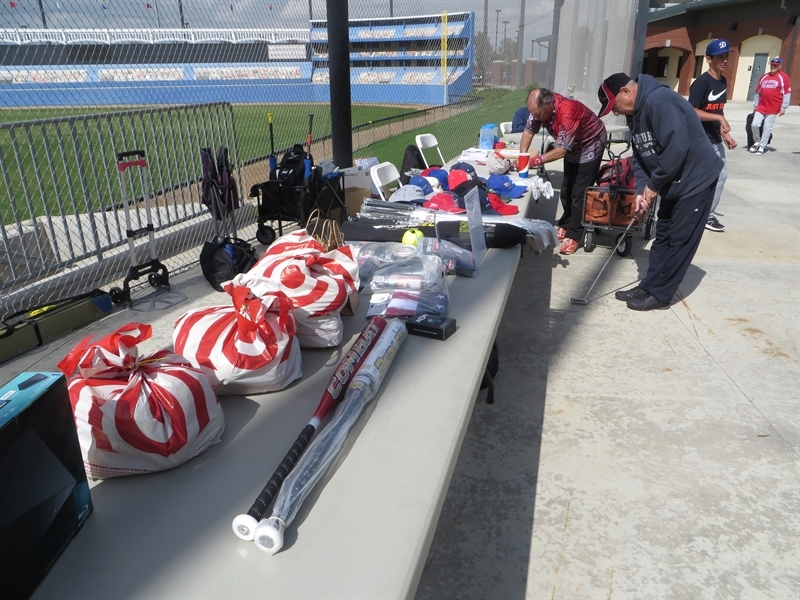 Over 50 prizes were raffled off throughout the afternoon; including softball bats, golf clubs, and a blu-ray disc player. 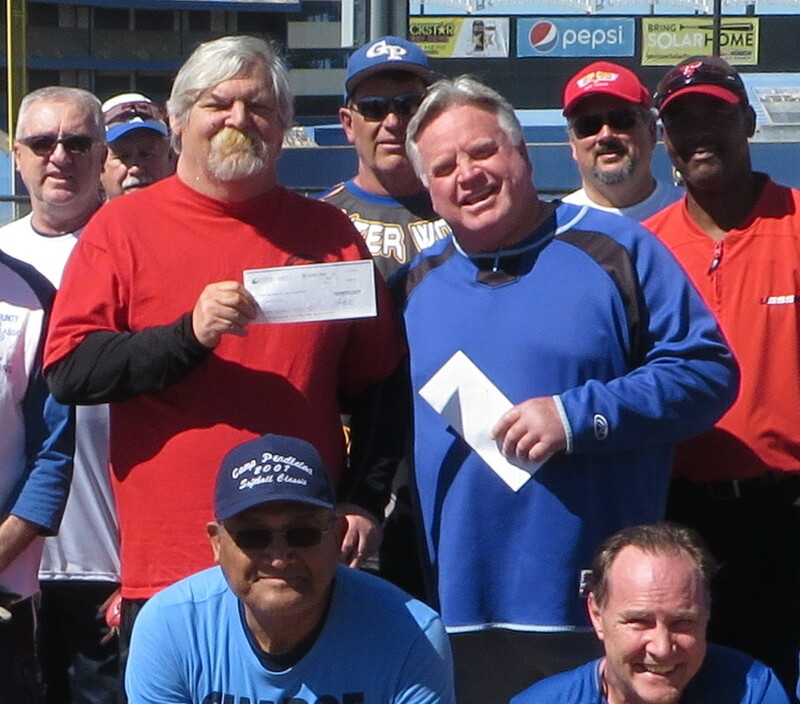 ** RAFFLES near Yankee Stadium. 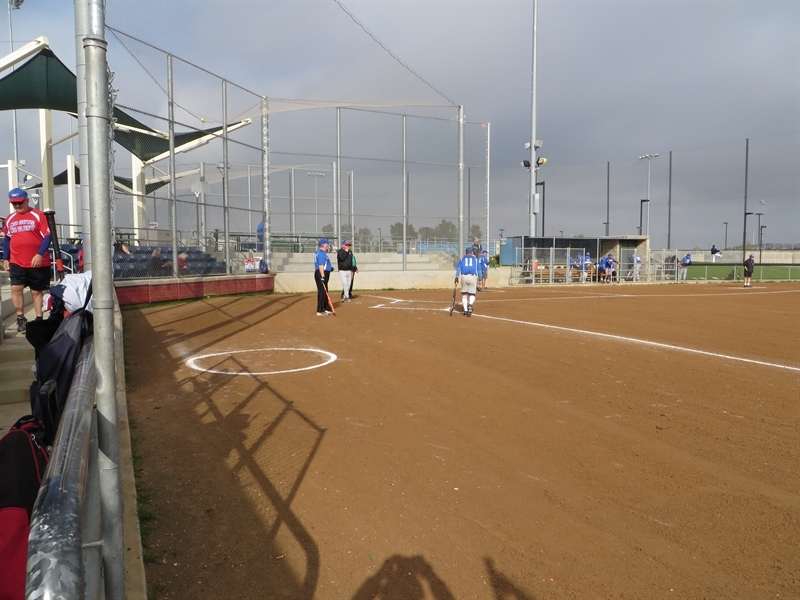 Coin flip for home team unless equalizer is required. 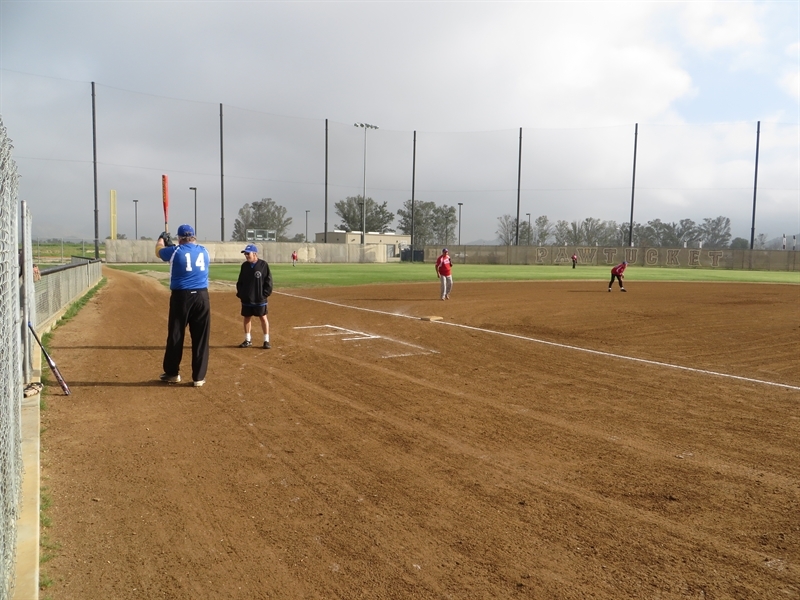 Team giving the equalizer will be the home team.